A wrongful death is defined as a death that is caused by the misconduct of another person or entity; whether by an intentional reckless act of malice or by negligence. It's important to note that a corporation can be just as liable in a wrongful death lawsuit as an individual - a prime example of this would be of a drug company manufacturing a dangerous drug that is sold to a consumer. If you believe that your loved one lost their life due to the actions of another, contact our Knoxville wrongful death attorneys today to see if you have a claim. With decades of combined legal experience helping injury victims throughout Tennessee, we have recovered hundreds of millions of dollars in compensation for our clients and can help fight for the justice you deserve. To find out more, contact us today by calling (865) 247-0080 or simply fill out the "Free Case Evaluation" form located to the right. Similar to being compensated for an injury, the Tennessee wrongful death laws allow the dependents of the deceased to receive compensation. While there can be many factors that can contribute to a wrongful death, proving who is at fault is often quite difficult. The litigation process itself begins in a similar manner to that of a personal injury case - with the early investigation stages often determining if there is the possibility of a settlement with the insurance company of the at-fault party. However, if that seems to be an unlikely result, the complex task of assembling a case that is robust enough to stand up to a trial is planned and put into action. As laws of eligibility vary from state to state, it's important that to consult the services of an attorney, that can help explain the laws for your particular case. Here in Tennessee, the survivors and / or dependents of the deceased are often eligible to file a lawsuit for compensation. It's important to note that you must be able to prove that the death was not only caused by another person or entity, but that the survivors have suffered financial losses as a result. Due to the Statue of Limitations here in Tennessee, a wrongful death lawsuit must be filed within one year of the date of the death. The laws defining these limitations were created to provide Tennessee residents with a fair and just hearing for all parties involved. The logic behind this is that as memories of events fade over time, witness accounts and other factors can often become inaccurate, which can make it difficult for the truth to be revealed. 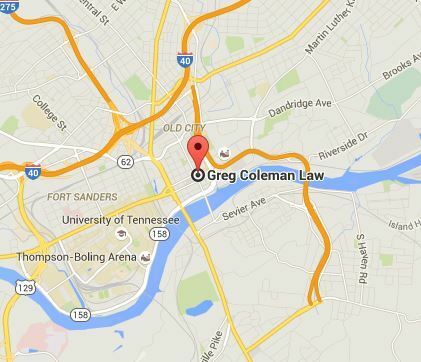 Despite wrongful death laws being complex and proving liability in a fatality quite difficult, at the law offices of Greg Coleman Law, our Knoxville based personal injury attorneys will prepare and successfully present the facts of your case to ensure that you receive fair compensation for the loss of your loved one. Our team strongly believe that if you have lost a loved one in Tennessee due to the actions of another, you are entitled to pursue justice. We have recovered hundreds of millions of dollars in compensation for our clients and can provide the experience and determination to fight for your MAXIMUM compensation benefit amount. To learn more about your legal options, please contact us today on (865) 247-0080 - a member of our team will evaluate your claim and then advise you on your next course of action. For those that would prefer to start immediately, simply click "here" and fill out the complimentary "Case Evaluation" form at the top of this page. It's 100% FREE and we will be in contact with you shortly after receiving your inquiry.